BF and I decided to celebrate our anniversary one Sunday night at Morton's. I had been there more than a few years ago with my parents, and remembered the infamous tray full of raw chunks of meat that they bring around to show you. You know what I'm talkin' about! This is what Morton's is known for! This way, you can see exactly what you're ordering- the marbling can tell you a lot about the steak. If the meat has little to no marbling, then it's very lean, no fat. This means that although it is leaner and often more tender, it is not as flavorful. Just remember- the more marbling, the less tender, but the more flavorful. You have to really find what you like in a steak and select based upon that. One more thing- the marbling should be thin streaks of fat. If it is thicker, then it contains a lot of connective tissue making the meat tough. To my dismay, our awesome server James (request James if you are heading down there!) brought us our drinks, and then brought us the menu. No tray or cart full of raw meat that I had excitedly prepared my BF for! After asking James why he hadn't brought the raw meat tray out yet, he told us there they had stopped showcasing their meat as of February of this year. What happened? There was a Morton's stock buyout.....though it wasn't all bad news. Morton's will be renovating shortly! The only negative is that they aren't allowed to bring out their raw meat tray anymore- only on request. As for the steak, service, price and atmosphere, I give Morton's a 3.5 out of 5. The Petit Filet that I had was the usual (small) size, had a nice flavor to it, but not as tender as Hy's or Ruth's Chris' Filet. BF had the Bone-in Ribeye, which was gigantic. The slice of meat was as big as the plate it was served on! He definitely took a doggy bag home! We also ordered a Caesar Salad and a French Onion Soup to start and shared a garlic mash when our steaks arrived. Everything was tasty, though I just wish my steak was a tad more tender. As for James- he was fantastic and a very humorous and entertaining guy. We left him a nice tip! Atmosphere-wise, it seemed to be infiltrated with many Japanese tourists, not the home-y, more local vibe you feel at Hy's or Ruth's Chris (Restaurant Row). It was also pretty busy on a Sunday night! All in all, it was a really nice, quiet evening and we both enjoyed ourselves. You gotta splurge sometimes, right?! The Red Velvet- had all of my favorite liquers! 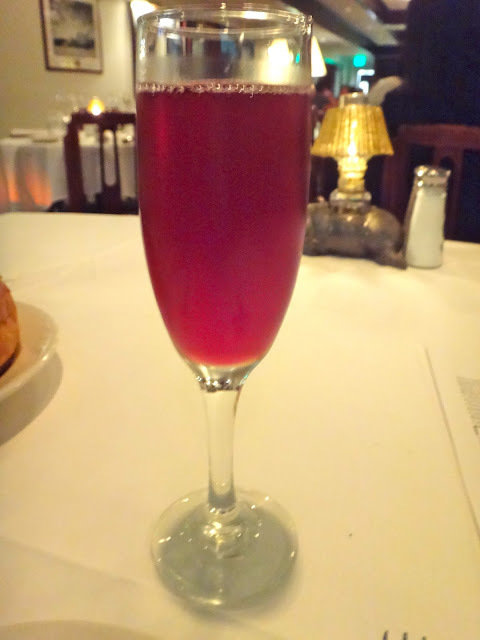 Prosecco, Lindemans Framboise Lambic Ale (Raspberry Beer), and Chambord Liquer made a fantastic combination. I was impressed. I loved that it was loaded with lots of melted cheese on top. Bone-in Ribeye- get it with the bone for much more flavor! We closed up the place! Red is my favorite color! 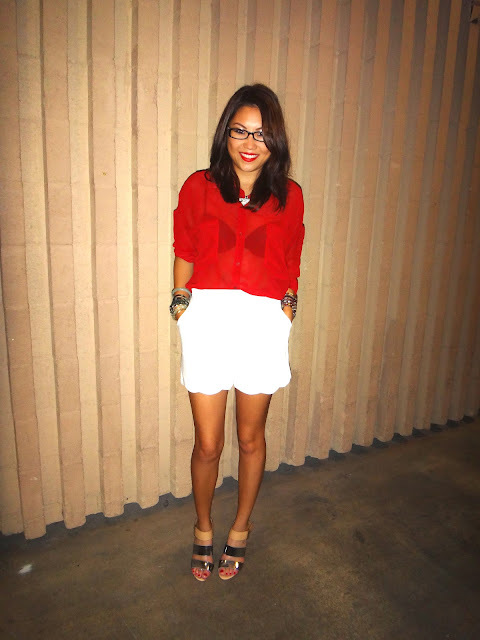 Looks clean and simple with these scalloped white shorts from Nasty Gal. Necklace via LMS Boutique, Marc Jacobs watch, and my new FAVORITE shoes- Sam Edelman Yelena. I like Mortons but it seems so expensive to me and way too much food. My preference is Ruth Chris.